Revoice Pro offers advanced facilities for tuning audio pitch blocks to selected musical scales and temperaments. Essentially this displays a background "grid" representing either all the pitches possible in a particular tuning convention, or only the intervals of a selected musical scale based on that. Individual pitch blocks can be quantised only to the pitches in the selected scale. 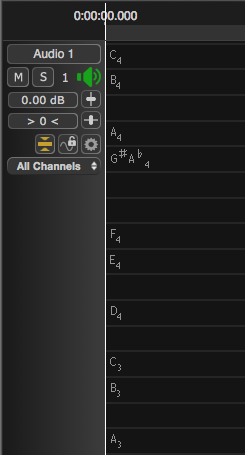 It also allows the tuning reference for that scale to be varied, so that tunings other than A4=440 Hz are possible. It is possible to restrict pitch block movements to these grids. If you hold down the option or alt key, the vertical movement of blocks will be snapped to the pitch grid, plus or minus any offset they originally had. 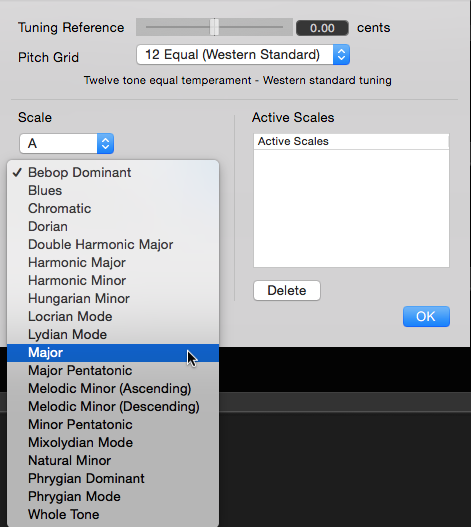 As can be seen from the example setup dialogs above, it's possible to choose the pitch grid or temperament on which the scale tuning is based (e.g. 12 note equal temperament as currently selected, or say the baroque organ temperament Werckmeister III), the base key of the scale displayed (showing A), and the type of scale (currently selecting Major in the right-hand picture). 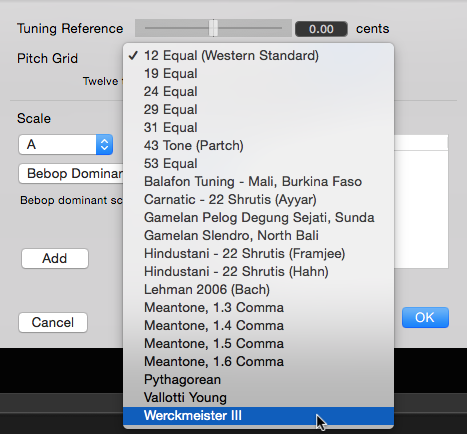 Other esoteric tunings are available, including various microtonal scales, Gamelan scales and historic temperaments. Furthermore there is a whole range of major and minor scale grids, based on these temperaments, as well as jazz and modal scales such as Bebop and Blues. So as you can see to the right, when a track is expanded and the pitch grid is visible it shows only notes of the selected scale, in this case A harmonic minor. In modes that allow the manual editing of pitch, such as Warp and APT, individual notes can be dragged to the pitches on this grid so that they are automatically tuned to the scale and temperament concerned. The Correct Pitch tool can also be used to pull all selected notes towards the nearest note in the selected pitch grid, with the strength selected for that tool.